McNicoll Avenue at Boxdene Avenue. 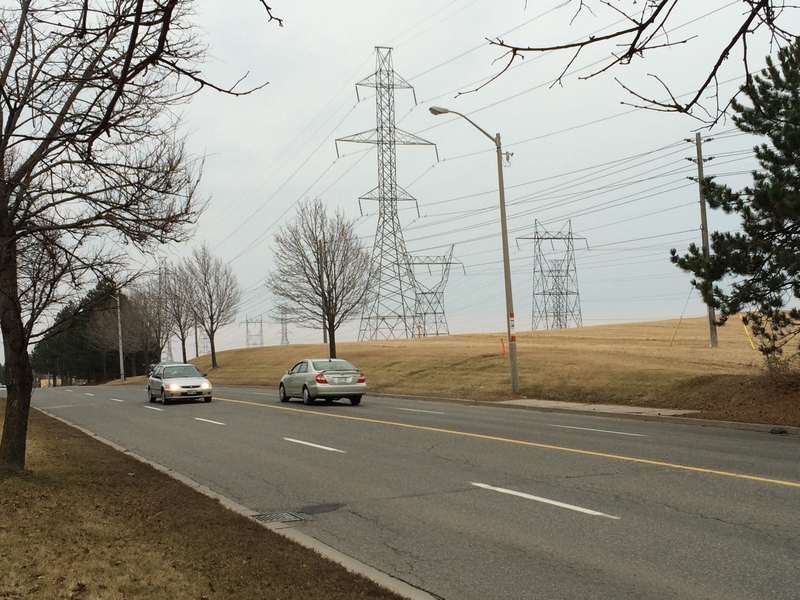 There’s no sidewalk on the south side of this busy Scarborough road. Update: I posted a revised and updated version of the map and article on Spacing Toronto. There, I mention a new absurdity in the war on sidewalks: on Glen Scarlett Road, near the old Stockyards in Toronto’s Junction neighbourhood, the city is proposing a new sidewalk for 2016 as part of a road reconstruction project. This logic is completely counter-intuitive. It ignores the needs of workers walking to work, and local residents walking to the streetcar loop at St. Clair Avenue and Gunns Road, or to nearby shopping and residential areas. There was a very interesting interview on CBC Radio’s Metro Morning on Tuesday, February 16). Host Matt Galloway spoke with Fiona Chapman, the City of Toronto’s manager of pedestrian projects, on missing sidewalks. Nearly one-quarter of all local streets in Toronto don’t have a sidewalk; many more only have a sidewalk on one side of the street. Chapman was discussing a presentation to the City’s Disability, Access, Inclusion and Advisory Committee on staff recommendations that would seek to fix this problem. Static map showing the City of Toronto’s sidewalk inventory as of 2011. Most local streets that don’t have sidewalks are found outside the old Cities of Toronto, East York and York, particularly in parts of Etobicoke, North York and Scarborough built in the 1950s and 1960s. Some of these residential and industrial streets were built with ditches instead of storm drains; others were laid out without sidewalks in mind. In the master-planned Don Mills development, there are many walkways connecting parks, major roads, and schools; it was likely intended that these would be used for getting around on foot rather than sidewalks. In other post-war subdivisions, particularly affluent areas like those in central Etobicoke, it was probably assumed that everyone would get around by car. The City of Toronto is hoping to change this. As roads come up for reconstruction, the new policy, recommended by staff, is to install a sidewalk where there isn’t one already, even despite local opposition. The current policy, in place since 2002, is that a new sidewalk could only be installed on an existing local street after the local councillor completed a consult of the neighbourhood and there was a consensus supporting the installation. In Toronto, the installation of new sidewalks has been surprisingly controversial. But the city’s presentation lists some of the reasons why sidewalks are often opposed. Sidewalks have to be cleared by the adjoining landowner. Residents can’t park their cars in the driveway if they block the sidewalk. They might result in the removal of landscaping or trees. And there is a minority who just want to keep outsiders out of their neighbourhoods. You could call this NIMBY-ism, even though sidewalks are technically is in the front yards, not the backyards, of local opponents. Sidewalks provide safe, accessible routes for pedestrians, especially important for people using strollers or mobility devices. They promote the city’s initiatives encouraging children to walk to school, for all persons to engage in physical activity, and for seniors to age at home. City policy, including the Toronto Pedestrian Charter, supports sidewalks. On Chine Drive, in an affluent part of Scarborough near the Bluffs, local residents opposed the construction of a sidewalk, even though it would provide a safe path to a nearby school. Since 2004, some residents opposed the sidewalk, claiming that they were afraid it would “take away from the rustic look of the neighbourhood.” Supporters, including parents with young children, wanted a safe route to the local school. It took ten years, but in 2014, the sidewalk was installed. Last year, on nearby Midland Avenue South, there was a similar fight to keep sidewalks off of that street. This is despite the fact this section of Midland Avenue is designated as a collector road, and is part of the Waterfront Trail’s route in the Scarborough Bluffs area. The city owns the land, known as a boulevard, where the sidewalks would go, but without the consent of local homeowners, the city was left in a bind. This new city policy will hopefully solve this problem. Below, I created an interactive map of the City of Toronto’s sidewalk inventory, created with data from the City of Toronto’s Open Data Initiative. It shows each public street in the city of Toronto (excluding private roads and laneways), as of 2011. I made a few edits, such as including the new Chine Drive sidewalk, and correcting a few errors that I was aware of. Almost every arterial and collector road in Toronto has a sidewalk on at least one side of the street. Exceptions include Highway 27 and Black Creek Drive, where, like expressways, pedestrians and cyclists are prohibited, the Bayview Drive Extension though the Don Valley, and in the far northeastern part of Scarborough, in Rouge Park. But it’s the local streets, marked in orange and red that are most apparent. Providing safe, accessible, and consistent pedestrian infrastructure is simply the right thing to do. The city owns the land on which sidewalks can be put down, if they aren’t already. There are legitimate concerns that need to be taken into account when new sidewalks are proposed — trees and landscaping especially — but at the end of the day, the needs of vulnerable road users need to be addressed first and foremost. This entry was posted in Maps, Toronto, Walking and tagged Pedestrian, Sidewalks, Toronto, Walking. Bookmark the permalink. Nice mapping. Wondering if when sidewalks are installed, we can make sure to keep the ditches for a future sustainable storm water management system which would include dry ponds; to which these ditches might run to. Thanks for the very informative map, and for reporting this issue. Is there a process to report updates/corrections to the map? For example I noticed that Wynford Dr is indicated as missing both sidewalks, however I can confirm there are sidewalks on both sides of this street (I work in the area, commute by TTC and often go for walks on my lunch break). Thanks. I noticed a few errors from the city’s sidewalk inventory, and corrected them. But with thousands of streets, I wasn’t able go though every record. The interactive map, created with CartoDB, allows me to make changes on the fly; I’ll probably update Wynford tonight or tomorrow. If anyone spots other errors, please feel free to post. I’ll gladly update it. I saw your post on Spacing and noticed a couple other errors on the map, but I figured it would be better to let you know here. There area around St Clair between Bathurst and Oakwood could use a some fixing up. Kenwood, Valewood and Cherrywood all have complete sidewalks. The top part of Humewood is right, but I’m pretty sure the weird little blip near St Clair is wrong. And Benson Ave north of the barns has a sidewalk on both sides. The other obnoxious half-sidewalks in the neighborhood are right, I think. Also, I have family on Chine, and they were against the sidewalk. It is remarkable to me as a renter how obtuse even smart, urbanist friendly people are willing to be when they think their property value is at risk. Thank you, Ian for the corrections. The City of Toronto created the original dataset through a remote sensing exercise, and I found many errors and updates that had to be made. Happily, the CartoDB online map is extremely easy to update, anywhere. Thanks Sean – you have nicely captured our challenges in adding sidewalks. Generally, the City only reconstructs about 4-5 local roads per year that do not have sidewalks – but these are once-in-a-lifetime opportunities. The great thing about adding a sidewalk with reconstruction is that it is possible to narrow the roadbed (depending on the original width) which can slow down vehicles, and to also realign the road to reduce any negative impacts to trees, landscaping and driveways. Toronto Water and City Planning are also in the process of developing Green Streets Standards and we look forward to having additional options available in terms of keeping our streets accessible, safe and sustainable.